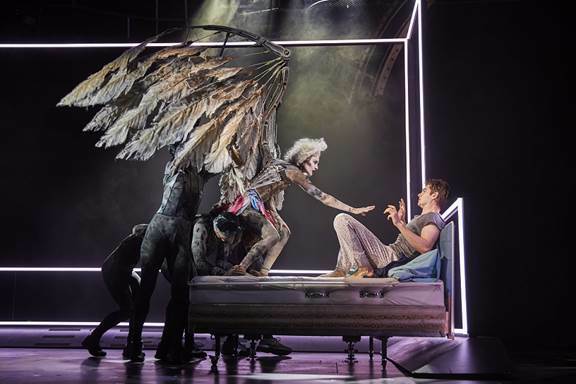 In its finest presentation yet, Tony Kushner’s masterpiece, Angels in America, A Gay Fantasia on National Themes spills its treasure over eight brief hours, before eager audiences most of whom were babes in arms when his great work – it really is much more a fantasia than a play – first saw stage light. It came at a crucial time. A terrifying, deadly plague was ravaging the country. Its back on Broadway at a crucial time, a time in some ways worse, in superb director Marianne Elliott’s hugely sweeping National Theatre production. You owe it to yourself somehow to see it in its roaring comedy, its aching tragedy, its decency, vulgarity, brilliance, rage, compassion. Never have all its elements worked so penetratingly, Kushner having fun, playing referential intellectual and visual games, castigating or caressing, silly, stern, wise beyond his years. Tony Kushner also an inveterate tweaker of his work. Thank goodness. The masterwork combining real and imaginary characters – it’s hard to call it a play because it was written without boundaries at white hot intensity , its wild flights left for the theatre gods to make real – has been realized in every dimension in director Elliott’s amazingly brilliant mounting, snow, rain, hail, heaven, flaming hell on earth. It takes every member of the cast and crew to bring this whole blessing into existence and the overall sense of commitment is completely winning. Scenic designer Ian MacNeil’s contributions are stunning in their ingenuity, simplicity, complexity, the backbone to director Elliott’s overall construction, especially with the help of the slithering, writhing, shoving Angel Shadows. 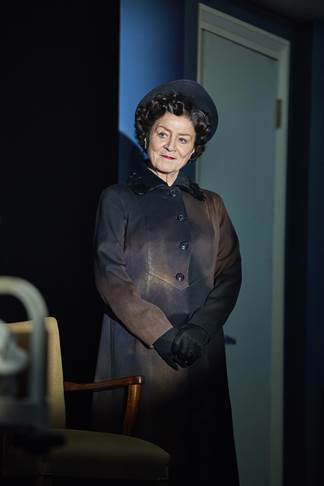 And Costume designer Nicky Gillibrand weaves her own triumph for everyone on Earth and Heaven. Everything else splendid, Hair, Wigs, Makeup, Movement, Lighting, Puppetry, Illusions, everything in director Elliott’s strong, tender hands. 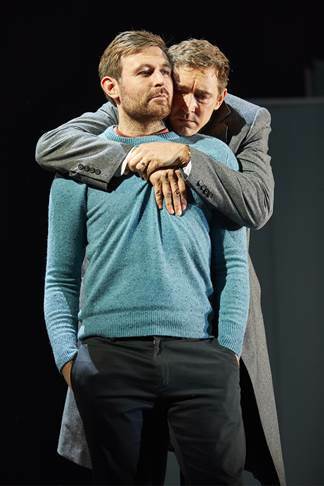 When AIDS strikes, it’s the Reagan years, and Part One, MILLENIUM APPROACHES, finds Prior Walter (Andrew Garfield in an award winning performance) with his lover, Louis Ironson (James McArdle in an award winning performance) bewildered with terror. Something evil is taking over Prior’s body. And mind. His hallucinations are so very real. His coping is hysterical but hysterically funny coping doesn’t stop the lesions, the blood gushing, the agonies. Terrified, afraid for his own life, Louis leaves, just plain leaves. Prior is left alone to die. Who stands by Prior? Former lover Belize, an AIDS nurse (Nathan Stewart-Jarrett in an award winning performance). Innocent man-boy Joe Pitt (Lee Pace in an award winning performance) and his wife, girl-woman Harper, (Denise Gough in an award winning performance) newly arrived from Utah, newly married, cannot fit into the city, cannot fit with each other. Her inability to make adjustments drives her into herself and out of her mind. It drives Joe into the Rambles in the park to watch, his deeply suppressed homosexuality trembling. He’s a young lawyer and he’s privileged to meet the lawyer of lawyers he idolizes, Roy Cohn (Nathan Lane in an award winning performance) scary, scathingly hilarious, who takes under his dangerous wing beautiful Joe, perfect acolyte, married, Mormon, bright, upright and eager. 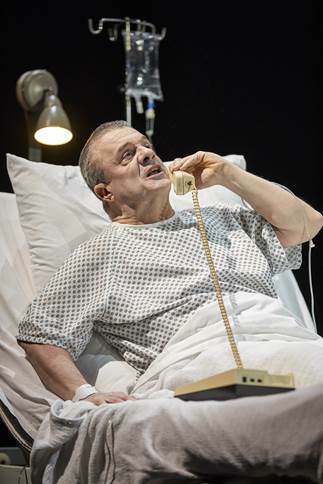 Roy’s doctor (Sarah Brown in one of her many multisex roles) tries to tell Roy Cohn he must go to hospital, that he has AIDS. Cohn blasts him. He does not, he will not, he cannot have AIDS. He has liver cancer he orders. Which does not gibe with his locked stash kept in his hospital room of AZT, the unobtainable miracle drug for AIDS. Not unobtainable for Roy Cohn. An angel (raging Amanda Lawrence) appears to flailing, frenetic Prior in his fearful, real hallucinations, pronouncing him a prophet. Louis finds Joe in the Rambles, seduces him. In an agony of released passion, Joe falls in love with Louis, calls his mother Hannah (marvelous Sarah Brown again) in Utah, tells her he is a homosexual. Hannah sells her house, goes to New York to rescue her son. We are in PERESTROIKA, Part II of Angels in America. Harper, very alone, in the cozy madness of her mind visits Antarctica, perfect for her utter misery. Roy Cohn, too, has hallucinations. Ill fated Ethel Rosenberg (Sarah Brown at her best) comes to see him die. Cohn was responsible for her execution as a spy. She has waited in the netherworld for her revenge until now. After a month Louis rejects Joe, who is madly in love with him. He wants to go back to Prior. Who will not have him. Joe guilt ridden, bereft, returns to Harper, but she rejects him. He goes to father figure Roy Cohn, admits he is a homosexual. Roy screams his hatred. Prior, visited by his angel, refuses to answer her demand to go at once to Heaven, where she says he is needed. They wrestle. He gives in, finds Heaven in darkness and disarray. God, displeased with Heaven and Earth, has left. Angels in America, At the Neil Simon Theatre, 250 West 52nd Street. Tickets: $99-$498. 212-250-2929. Part 1, 3hrs 40 , Part 2, 4 hrs 10 min. 877-250-2929. Check availability. Thru June 30.